If you like the first three piano concertos of Beethoven, you will like these concertos. He studied with Beethoven and his music shows it. Well performed on this Naxos CD 8.557638. Well worth adding to your collection of piano concertos. Wow. It's been a while since I thought of--let alone listened to--anything by Ries. Somewhere I still have an old Vox Turnabout LP by Felicial Blumental...or is it Maria Littauer?...with one of Ries's piano concerti coupled with one by Mayr, I think. Blumental, Littauer and a third pianist, Rena Kyriakou, were sort of the "queens of the unknown piano concertos" for the Vox label back in the days of vinyl. Don't see a link for the Naxos you mention. I'll look it up to see what's on it and who's playing. Anyone know these and want to discuss? Thanks. Last edited by dirkronk on Tue Jan 12, 2010 9:24 am, edited 1 time in total. I'm up for that. Just ordered it from Amazon Marketplace. Thanks. D wrote: I'm up for that. Just ordered it from Amazon Marketplace. Thanks. Just checked smitty's number against the listing in the online Naxos catalog and the "volume 1" (which is the one with the 4-1/2 stars) is the one that corresponds. Enjoy. And let us know what you think when you get a chance to listen. dirkronk wrote: Wow. It's been a while since I thought of--let alone listened to--anything by Ries. Somewhere I still have an old Vox Turnabout LP by Felicial Blumental...or is it Maria Littauer?...with one of Ries's piano concerti coupled with one by Mayr, I think. Blumental, Littauer and a third pianist, Rena Kyriakou, were sort of the "queens of the unknown piano concertos" for the Vox label back in the days of vinyl. Blumental’s name will be familiar to many of those who collected LPs in the 1960s and 1970s. A specialist in repertoire that was off the beaten path, Blumental made recordings of concertos by Hoffmeister, Clementi, Hummel, Kuhlau, Arensky, and many others. These appeared on the Turnabout label; I’ve also seen them more luxuriously presented by Unicorn. Blumental’s recordings seem not to have made the transition to the CD era in any great number, although I’ve picked up a few titles from Berkshire Record Outlet on the Dutch Dureco label. Brana, a CD label I’ve not encountered before, has 24 (!) Blumental titles in its listings, and apparently not much else. These people love their Felicja, and after hearing this CD, who can blame them? She sure knows how to show a fellow a good time! Blumental was born in Warsaw in 1908, and her teachers at the Warsaw Conservatory included Karol Szymanowski. In 1942, she emigrated to Brazil, and over the next several decades she was particularly active in Latin America and North America. She did not limit herself to music from the Classical and Romantic eras, but also became closely associated with Villa-Lobos, and with Penderecki, who wrote his Partita for Harpsichord and Orchestra for her. She died in Tel Aviv in 1991. These two concertos are not masterpieces, by any stretch of the imagination, but they are charming and fun to listen to, and they might be thought of as “missing links” between Beethoven’s piano concertos and those by Chopin. Both Czerny and Ries studied under Beethoven, of course (indeed, this CD’s title is “The Pupils of Beethoven”), and Czerny was one of Liszt’s teachers, so one can trace the evolution of styles—if one isn’t giggling in delight over the music’s tuneful and often garrulous naiveté instead. I’ve yet to encounter anything particularly “ladylike” in Blumental’s playing. It’s certainly not tainted by snobbery or self-conscious refinement. She pretty much takes hold of the music and runs with it without apologies. (The engineering, which practically places Blumental’s piano on our laps, contributes to the “in your face” quality of these recordings.) Hyperion’s series, “The Romantic Piano Concerto,” has given us more polite recordings of works in this genre (although I don’t think they’ve gotten to these specific concertos yet). I don’t think that Blumental’s recordings will be outclassed by them, however, because they have an innocence and a spontaneity which are becoming increasingly difficult to find in recording studios. There’s real love here, even though it isn’t always expressed in the most polished terms. Blumental’s partners are understanding and competent—not that they have a lot to do in these works. They sound better here than they did on Turnabout’s vinyl; this digital makeover has been good for them. I’m also taken by Brana’s abstract cover art on all of the Blumental releases. (Here, the artist is one Markus Mizne.) Compared to what I’ve seen from many of the major labels lately, this is a decided step up. This second instalment in the continuing cycle of Ries's piano concertos from Naxos is a disc for your wish-list. Ries is more famous today for being Beethoven's pupil and biographer than for his own career in music. In his day he ranked with Hummel and, yes, even with Beethoven himself as one of Europe's greatest composer-pianists. Thanks to the efforts of Naxos and Allan Badley's Artaria Editions, we can now hear for ourselves what it was that so excited nineteenth century audiences. All three works here show Ries to be a composer of originality, though one with a respect for his musical forebears. It would go too far to call him daring or revolutionary. Nonetheless, despite the backward glances at Mozart, his facility for contrasting grand orchestral statements with piano writing of a free, rhapsodic lyricism bridges the gap between Beethoven on the one hand and Chopin and Schumann on the other. The Swedish National Air with Variations opens with a proud and darkly coloured orchestral flourish, which is immediately contrasted with a gently glittering statement from the piano. This pattern of contrasts is repeated throughout the 15 minutes of this piece, as Ries plies his skill at conjuring variations, first dazzling, then soulful. He casts the orchestra as chorus rather than as equal partner in dialogue, but he knows how to use its tone colours – listen to the lovely clarinet commentary about five minutes in, for example. The Piano Concerto in C sharp minor is a delightful work, written largely on the road as Ries toured and then fled Russia in 1812. It is natural to want to draw comparisons with Beethoven's C minor concerto of 12 years earlier, but similarities are few and comparisons unhelpful. Apart from a few blustery tuttis, Ries uses the minor mode to spice harmonies and lend interest rather than to generate Beethovenian drama. The material is predominantly lyrical but virtuosic in the outer movements. The central slow movement lasts for less than five minutes, but is the heart of the concerto. Here Ries'sw gentle lyricism calls for a Chopinesque rubato and lightness of touch. His writing for orchestra, though, is better than Chopin's and full of interesting details and colourings. The Introduction and Polonaise may have been composed 21 years after the other two pieces in this programme, but it demonstrates a remarkable consistency in Ries's idiom across the years. This piece is full of Mozartean turns of phrase, but with harmonic touches that point to Schumann. Again, there is some charming writing for the clarinets and flutes as they comment on the piano's discourse. The Austrian pianist Christopher Hinterhuber plays with commitment and is a fine advocate for these works, just as able to command attention with flashes of fire as he is to lead the ear through the most delicate figurations. Grodd and the Gävle Symphony Orchestra support him well enough, though there is a little raggedness in the upper registers of the violins towards the close of the Introduction and Polonaise. The recorded sound is fine and the booklet notes by Allan Badley are interesting, though they hint at but do not explain the reconstruction of the score of the C sharp minor concerto. All up, this disc offers you satisfying performances of satisfying music. How can you refuse? Just recently listened to a couple of his symphonies, and you think you're listening to Beethoven but something is missing. The tension, the overall arc just isn't there. Still they're well crafted and quite enjoyable to listen to and probably better than Wellington's Victory. Also, I have a recording of "King in Israel" that is very impressive. I've only had the chance to hear it once so far though. Sorry to digress from the piano concertoes, but I've not seen a Ries thread for a while. With apologies in advance to smitty, I'm tempted to do a bit of a hijack job on this thread---mainly to ask the folks on this board about other Ries compositions. 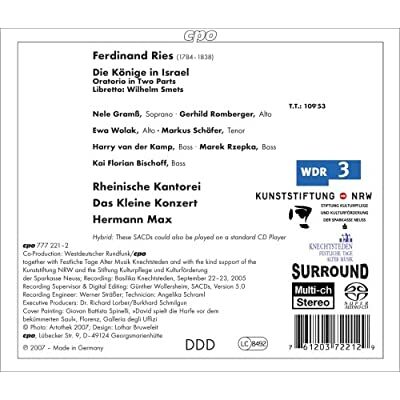 Looking around online reveals that there are Naxos, CPO and other label recordings that have made available the piano concertos in question AND symphonies, sonatas, trios and other chamber music by Ries! Who knew he wrote such a wide range of musical works? And what do "in the know" readers feel are his best works to track down? My reason for asking is simple. Years ago, when I was stuck in a sort of rut of listening to orchestral works only, I found myself believing that the only things worth hearing by Mendelssohn (to take one example) were his Italian & Scottish symphonies, the MSND music and the Hebrides overture. Then someone essentially forced me to sit down and listen to some of his chamber works...and a whole new beautiful world opened up for me. Since that experience, I try to remember to ask about "other stuff" when I run across a composer who's new to me. So...do we have any serious Ries aficionados among us? If so, make with the recommendations, please! If you're into oratorio at all, you should have this. Ries owes a lot to Handel, Haydn and Beethoven. Some of it, like the closing number of Act I, is quite innovative. Ries also makes good use of brass and the harp for accompaniment. The libretto for this is not much. Apparently, a lot of the "good stuff" had already been taken - the Creation, the Messiah, even Saul and Esther. So we have this libretto on two kings (thus Konige) of Israel, Saul and David. With rivetting verses like "Saul has slain thousands, but David has slain tens of thousands". Seriously, that is a high point. There is a silver lining to this. As its all sung in German and nothing much happens anyway, no need to worry about the translation if you don't know German. Just listen to the gorgeous melodies. The best vocal parts in the score are those sung by the Philistine chorus. The Hebrew choruses are much too solemn but the Philistines know how to generate some excitement. You can hear the two of them battle it out vocally in that closing chorus of Part I which I mentioned. A smack down for the Philistines, vocally speaking that is. dirkronk wrote: With apologies in advance to smitty, I'm tempted to do a bit of a hijack job on this thread---mainly to ask the folks on this board about other Ries compositions. I agree the guy needs more play. I've recently heard a couple of his symphonies and can't imagine how he escaped my ears all these years except that he don't get much air time. Mark Simon said something to the effect of these lesser lights all sounding like Beethoven, Mendelssohn, or Liszt. That may be true, but if you like those three, or if you just want to hear something besides yet another recording of those three, and the atmosphere is the same, I say go for it. One of the most attractive things about J.C. Bach and Paisiello is that they come out of the same musical milieu as Mozart, and who can ever have enough Mozart? slofstra wrote: Yesterday I took 2 hours+ to listen to Konige in Israel. It's in SACD on the CPO label. I can't actually play SACD as SACD .... yet. (All unnecessary outgoing cash flow is on hold until we see more business coming in, but I have my eye on the OPPO special edition!) However, I have noticed that invariably SACD discs sound better in CD as well. That makes sense. To make a new SACD disc you have to have a high quality recorded source so the CD benefits. On SACD in general. Based on some A-B testing using a low end Oppo player, I found that nothing benefits from SACD as much as human voice, especially oratorio. I would guess that this disc would sound glorious on an SACD player. The effect of SACD playback is to make the sound warmer, less harsh. Chalkie, are you much of an oratorio fan? e.g. Messiah, Elias, that kind of thing? Do you have this disc?